Modern organizations have tried to increase the collaborative effort by creating centers of expertise, regional hubs and invested heavily in collaborative technologies. However, despite all the investment, invariably they fall short of the mark because open-plan office design has shown that it is negatively related to workers’ satisfaction with their physical environment and perceived productivity — the main complaints: noise and lack of privacy. Collaboration has been at the center of organizations for many years and I daresay it will continue to be somewhat of a requirement for as long as people choose to work in groups. For all intents and purposes, collaboration is a great mechanism but it doesn’t mean that everyone collaborates in the same way nor should a one-size-fits-all approach be expected to deliver exceptional results. … although open-plan offices often fostered a symbolic sense of organizational mission, making employees feel like part of a more laid-back, innovative enterprise, they were damaging to the workers’ attention spans, productivity, creative thinking, and satisfaction. The open-plan office was originally conceived by a team from Hamburg, Germany, in the nineteen-fifties, to facilitate communication and idea flow — the new movement was called Burolandschaft (office landscaping). But a growing body of evidence suggests that the open office undermines the very things that it was designed to achieve. In 2011, the organizational psychologist Matthew Davis reviewed more than a hundred studies about office environments. He found that although open-plan offices often fostered a symbolic sense of organizational mission, making employees feel like part of a more laid-back, innovative enterprise, they were damaging to the workers’ attention spans, productivity, creative thinking, and satisfaction. To say that the noise generated in open-plan offices is distracting would be an understatement. Unanswered phones, conference calls, catch-ups, laughing, arguments and the constant churn of people moving about takes a lot of energy to filter out. The psychologist Nick Perham, who studies the effect of sound on how we think, has found that office commotion impairs workers’ ability to recall information, and even to do basic arithmetic. Libraries are quiet places for a reason. If one tries to be productive, attentive and creative it is best done in a place of peace and quiet, anything else is damaging to one’s health. In laboratory settings, noise has been repeatedly tied to reduced cognitive performance. Cramming people one on top of the other is probably the human equivalent of battery hens — the egg gets laid but the chickens are far from being happy. I wonder if Sir Isaac Newton’s Law of Universal Gravitation would have come to the fore had he been crammed into a rowdy open-plan office instead of a tranquil garden? Given these pervasive distractions, proactive employees are likely to show up wearing noise cancelling headphones to eliminate the mind-numbing noise. Noise cancelling headphones are a great little invention, they might not eliminate the screaming baby back at home but they sure make light work of toning down the office chatter. But listening to music to block out the office noise may not help as much as we may think. In fact, Perham found that listening to music impairs mental acuity. Interestingly, in another study, he found that disliked music can be better for performance than liked music. … unliked, unfamiliar music could be better for performance than liked, familiar music. Although both liked music and disliked music impaired serial recall performance. A survey of some forty-four thousand workers, found that interruptions by colleagues were detrimental to productivity, and that the more senior the employee, the worse they fared and may set forth a process leading to stress. Just because someone is sitting at their desk doesn’t mean that they are free to talk to any passer by. Organizations should stop using collaboration as the main driver for open-plan offices. Let’s be realistic, although open-plan offices may have started out as well-intentioned collaborative experiment, these days they exist purely for economic reasons. 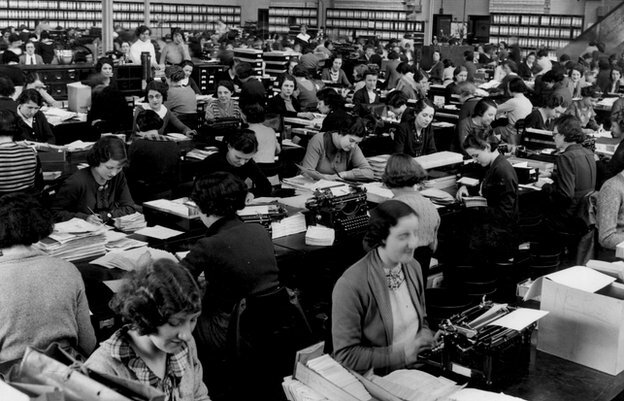 It is far easier to cram twenty desks into a single space than construct individual offices. One can’t force collaboration onto anyone who doesn’t want to collaborate. Simply put, some individuals have their own style of “collaborating” and should be left to their own devices instead of being thrown to the wolves like a sacrificial lam to appease the gods of chaos. Similarly, just because a colleague sits within a PC’s throw away from the next, doesn’t mean they are going to talk to each other. Proximity doesn’t generate productivity nor collaboration. As the old saying goes: you can bring a horse to water but you can’t make him drink. Psychologically, the repercussions of open offices are relatively straightforward. Physical barriers have been closely linked to psychological privacy, and a sense of privacy has been shown to boost job performance. A 2009 study in Sweden found that occupants of private offices were most happy with their environment, while most dissatisfaction was registered in medium and large open-plan offices. … most dissatisfaction is reported in medium and large open-plan offices, where the complaints about noise and lack of privacy are especially negative. For this study, employees rated their perceptions of and satisfaction with the office environments of seven different office types, which were classified as cell-office, shared-room office, small open-plan office, medium open-plan office, large open-plan office, flex-office, and combi-office. Three domains of environmental factors were analyzed: (1) ambient factors, (2) noise and privacy, and (3) design-related factors. The analysis of frequencies in complaints within the three domains showed that noise and privacy was the domain that causes the most dissatisfaction among office employees. Cell-office employees are most satisfied with the physical environment overall, followed by those in flex-office. The most dissatisfaction is reported in medium and large open-plan offices, where the complaints about noise and lack of privacy are especially negative. I don’t think that open-plan offices will disappear any time soon nor do I think that disruptive colleagues can be re-educated overnight. If you happen to be stuck in an unbearable open-plan office, you might not be able to do anything about the levels of noise if they are generated in pursuit of genuine business activities. However, you can certainly control your own interaction with other people by laying down some ground rules to curb their disruptive behaviour. A while back I had a sign plastered next to my desk “Question times: 10:00-10:30 and 15:00-15:30”. Whenever someone snuck up behind me for a chit-chat, I would simply point to the sign and continue working. I was probably branded as an antisocial prick who’s unwilling to contribute to the collaborative effort but it was a small price to pay for sanity. Rashid M, Zimring C. A Review of the Empirical Literature on the Relationships Between Indoor Environment and Stress in Health Care and Office Settings Problems and Prospects of Sharing Evidence. Environment and Behavior. 2008 Mar 1;40(2):151–90. Bodin Danielsson C, Bodin L. Difference in satisfaction with office environment among employees in different office types. Journal of Architectural and Planning Research. 2009;26(3):241–57. Perham N, Sykora M. Disliked Music can be Better for Performance than Liked Music. Appl Cognit Psychol. 2012;26(4):550–5. Perham N, Hodgetts H, Banbury S. Mental arithmetic and non-speech office noise: an exploration of interference-by-content. Noise Health. 2013 Feb;15(62):73–8. Sundstrom E, Burt RE, Kamp D. Privacy at Work: Architectural Correlates of Job Satisfaction and Job Performance. The Academy of Management Journal. 1980 Mar 1;23(1):101–17. Davis TRV. The Influence of the Physical Environment in Offices. The Academy of Management Review. 1984 Apr 1;9(2):271–83. Brennan A, Chugh JS, Kline T. Traditional versus Open Office Design A Longitudinal Field Study. Environment and Behavior. 2002 May 1;34(3):279–99. Spoke my mind :) Thank you, great article. There were a few early adopters who believed that open-plan offices would help them function more efficiently. Of course, back in those days they had a no talking rule. A very narrowminded view of what ‘work’ is. Many references but full of generalizations. Architects, designers and other creative professions have been working in open plan offices for generations. I agree for some activities aren’t compatible with open plan offices, but that’s why an office environment should offer a range of space types. In fact if you look at many new and refurbished work places that is exactly what is happening. Yes this is partly based on money – the need to save on space and energy costs – but also a close analysis of user needs.